The Niagara Falls Holiday Market: Great Success? Remember the Niagara Falls Holiday Market? The one I wrote disappointedly about in late November, and took a lot of flak about it from people who equate “honest criticism” with “negative naysaying”? Despite an alleged budget of $900,000 (I challenge anyone to figure out where that money went); $450,000 of which came from the taxpayers of the City of Niagara Falls and the State of New York, the market ended $31,000 in the red. – There was a line-item of $114,000 for “salaries”, and the organizer won’t disclose to the city who received it. – It cost $40,000 to stage an Aaron Neville concert that brought in a mere $9,000. – The city council wants the market and its organizers to justify and account for its supposed costs of almost $800,000. – Tony Walker was a prominently billed vendor, scheduled to take 10 huts. It never showed, but the organizer himself apparently opened and operated up to seven vending booths himself. – The organizers used photos of other Christmas markets, ice rinks, and Christmas trees in order to promote the one at the Niagara Falls market – all of them were misleading at best. – Numerous people claim to have been stiffed by the market organizers. (One of the vendors retained my professional services in early 2012, and was ultimately paid – others were not so lucky). – The market claims that the ice rink cost $147,000, but the rink operator says the contract was for $99,000. – Only about 370 people actually skated on the $100,000 rink, which saw gross receipts of $6,463. – A BPO concert grossed about $7,500, but cost over $17,000 to stage. – Elizabeth von Trapp grossed about $2,800, but cost about $3,500 to stage. – The Canadian Tenors grossed about $9,300, but cost over $40,000. – Organizers promised the city and state that over 80 vendors would participate; only 35 showed up. – Promises were made that the event would generate $30,000 in sales tax for the city, but there’s scant evidence that all vendors were diligent about collecting sales tax, or of any bump in revenue. Likewise, there were promises of 300 part-time jobs, over $30,000 in parking revenue, and $3,000 in bed tax revenue – no proof exists that any of those promises were met. – With respect to the Idaho developer, Mark Rivers, who organized the market, he reportedly operated 7 booths himself, and questions are being raised whether his staffing or inventory costs were subsidized by taxpayers. – According to the Reporter, the market took in about $90,000 and spent about $767,000, with a net loss of over $670,000. Based on the evidence, it would appear as if the market wasn’t exactly a rousing success. While it did bring people to an otherwise empty part of town during the cold winter months, it was a fiscal disaster and a complete amateur hour. People who went there may have had a good time, but to equate what happened on Falls Street with a traditional European-style Christmas market is foolish. None of this would matter, of course, if it was just a budding entrepreneur who took a bath on a good idea that was poorly implemented. However, this particular entrepreneur used $450,000 from taxpayers in a very poor city and a cash-strapped state. That it was so vastly different in execution from what was promised in the inducement smacks of mismanagement at best, fraud at worst. There’s no reason, however, why Niagara Falls shouldn’t try again in 2012. After all, it’s got $100,000 in sheds to use. But this is an event that can be put on either by USA Niagara or, better still, by the Niagara Falls business community or a non-profit organization. There’s no reason it should cost $800,000, and it could be made much more festive than what was there last year. 1. This is a cool local Kickstarter project that was brought to my attention by local photographer and technologist, Clark Dever. The Woodworker’s Clubhouse, as the name implies it is an open access community woodshop that members can use the fully equipped woodshop for their woodworking projects. It is a place where people with a common interest in woodworking can meet, socialize and/or collaborate on their projects…a place to share resources and knowledge in a social/educational venue. It provides a place where they can use expensive tools and equipment they would not otherwise have access to. Buffalo needs more of these makerspaces as we slowly rebuild our culture of innovation, entrepreneurship, and appreciation for crafts and trades. I kicked in a few bucks and I think you should as well. 2. Seven years ago at Kenyon College, David Foster Wallace gave what is (in my estimation) the greatest commencement speech ever given. In 2009, after his suicide in the manner referenced below, the speech was adapted into a short book titled This Is Water: Some Thoughts, Delivered on a Significant Occasion, about Living a Compassionate Life. An incredible speech from one of America’s greatest and most misunderstood thinkers. If you’re averse to lengthy reading, you can listen to this speech here and here. 3. Is Facebook ruining marriage? Survey says…YES! More than a third of divorce filings last year contained the word Facebook, according to a U.K. survey by Divorce Online, a legal services firm. And over 80% of U.S. divorce attorneys say they’ve seen a rise in the number of cases using social networking, according to the American Academy of Matrimonial Lawyers. It’s not simply due to affairs and re-connections with old flames. In other studies, the social networking tool has proven to create profound feelings of loneliness and envy. So, you might want to rethink how often you check that news feed. Over the next several generations, the wave of minority voters — who, according to U.S. Census figures released this week, now represent more than half of the nation’s population born in the past year — will become more of a power base in places like Alabama, Mississippi and Georgia. That hold will extend across the Southwest all the way to California, experts say. The coming political revolution could result in a massive changing of the guard on nearly every level of government, potential cultural clashes, and the type of political alliances that are now considered rare. Republicans have staked their hopes for 2012 on motivating their shrinking base of white, religious, and angry voters to turn out in record numbers against the Kenyan socialist avatar they’ve constructed to represent Barack Obama. The rhetoric necessary to generate that turnout will make the acidic and horrifying tone of the 2008 general election seem like a dance around the maypole. Luckily for Democrats, the GOP establishment picked the one candidate who inspired the least amount of fervent support amongst the base. No one is excited to vote for Mitt Romney, except for people in magic underwear and rich white men who get semi-erections while reading about massive union layoffs. 5. A reporter was writing a story about the environmental dangers of tar sand oil mining. He wanted to get into the facility to take pictures, but the oil company wouldn’t let him in. So, he rented a plane and took photos from overhead. When I see pictures like this, I’m reminded that we can be described as parasitoids on this planet. That we will go to these lengths to mine for fossil fuels rather than invest in alternative and renewable means of energy is simply beyond my comprehension. Fact Of The Day: The land for Arlington National Cemetery was seized from the family of Confederate General Robert E Lee so that the Union dead could be laid at his doorstep. Video Of The Day: How a smartphone knows up from down. Governor Cuomo is wildly popular, and he’s getting loads of credit for helping to fix the state’s fiscal crisis, and also for implementing and advocating for reforms of the way in which the state does its business. Perhaps, however, the change he’s brought has been too tentative and not wide-reaching enough. Take, for instance, the case of Howard Nielsen, the owner of Sticky Lips BBQ in Rochester. I first became aware of his restaurant when I saw the new one being constructed along Jefferson Road, and I had a very nice lunch there recently. He’s written an exasperated open letter right on the front page of his restaurant’s website, called “So You Want to do Business in New York“. The land on which the restaurant sits is owned by the Genesee Valley Regional Market Authority and leased to Sticky Lips, which owns the building. It’s a small property – a former Roadhouse restaurant – and Sticky Lips completed its renovations through a private non-union contractor. It’s not a “public work”, he’s not required under any regulation or statute to retain the services of union labor, and he is just a guy who owns a restaurant who built it out and paid a bunch of people a lot of money to renovate and build it out. He didn’t use any public money to do so. But the shakedown began when, halfway through the project, a guy from the carpenter’s union showed up. It was a small job, and he was told, “no thanks”. Two days later, there was an OSHA guy camped out across the street with “a telephoto lens”. A few weeks later, a guy from the electrical union showed up. They were also told, “no thanks.” Two days later, an inspector from the state Department of Labor was on site, demanding to see the contracts to determine whether prevailing wages were being paid. I’m generally pro-union, and I respect the notion of collective bargaining to ensure that workers who choose to unionize are treated fairly. But that should apply to big business, or public works. Ultimately – it’s the workers’ choice whether to work for a union shop or not, and small businesses renovating a non-chain restaurant should, frankly, be left alone, much less harassed. And why is it that state and federal inspectors are seemingly acting in concert – one could even say on behalf of – the union? Bob Bibbins pressured me to go online to register this project with the labor department, which would automatically commit me or my contractors to pay prevailing wages. He said he would start the violation from the date he showed up, but wouldn’t put that deal in writing. I did not submit to this online filing. My lawyer at Woods Oviatt Gilman gave Bibbins our stance that we own the building privately and we are only making improvements to the building and not the land which it sits on. All I did was to put many construction workers to work. I bought hundreds of thousands of dollars of construction materials from local companies. At this restaurant, I have created over 120 good-paying jobs. The business will collect and pay hundreds of thousands dollars in sales, property, employment, and other taxes. Between my three restaurants, I have over 200 employees. I am contributing to the state, I am creating jobs. I am the type of businessman the state wants. 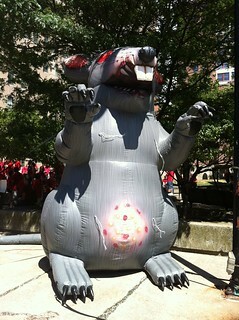 I feel like I am being attacked by these two unions, who have put pressure on the N.Y.S. Labor Department to see this through. Not only do I need to reinvest my profits to grow my business, but now I have to pay thousands of dollars in legal fees and worst case scenario – if the Labor Department wins, many more thousands for this prevailing wage issue. Is this the type of business practice I should expect from New York State as I try to grow my business in the upcoming years? Nielsen has appended some documents to his letter to prove his point. So, why exactly was this relatively small venture targeted? Shooting in Defense of Self-Defense? In the unlawful homicide of Trayvon Martin, accused killer George Zimmerman’s family are peddling his medical records from the day after Martin was shot and killed with a single bullet to the chest. Why are they putting this out? To poison the jury pool? To generate sympathy for the living shooter and make it seem as if the dead pedestrian armed with snacks was at fault? Zimmerman apparently had a nose fracture, black eyes, a few cuts, and two cuts on the back of his head. Martin had injuries to his knuckles. The difference is, of course, that the living Zimmerman’s injuries were revealed at a doctor’s appointment the day after Martin was killed. Martin’s knuckle injuries were revealed during his autopsy. Zimmerman is claiming that he killed Martin in self-defense. Yet this is a case where the known facts seem to indicate that Martin was walking home from the store when stalked and accosted by wanna-be cop Zimmerman, who was clearly upset at the prospect of a hoodie-wearing Black kid being in his neighborhood walking home. Zimmerman then disobeyed the demand of the 911 operator to not chase after Martin, and chased after Martin, accosting him. Understand that, from Martin’s point of view, he had no idea who Zimmerman was, or what he was doing. All he knew is that there was a large man who had been staring at him from an SUV, who was now chasing him down and trying to – what? Beat him? Kidnap him? Kill him? The only person in this situation who had the right to defend himself was Trayvon Martin – he was completely reasonable to defend himself against this unprovoked attack from an armed lunatic – by punching the lunatic in the nose, and trying to throw him off him. Zimmerman got his cuts and broken nose because he attacked an innocent and unarmed person. Shooting and killing Martin for getting a busted nose and cuts on his head? Totally unreasonable force from someone who admits he didn’t know whether Martin was armed. Zimmerman attacked the kid, and the kid was fighting for his life, and started beating the crap out of his attacker. 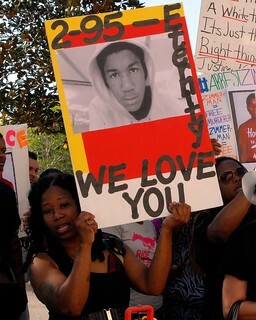 Zimmerman isn’t just a dummy who should let the cops do their jobs, he’s a horrible fighter. So, when you start losing a fight you provoked and started, that gives you the right to shoot to kill?